Lightly-raced four-year-old mare Hello It’s Me will attempt to add a second stakes victory to her record when she lines-up in the Gr.3 OMF Stakes (2000m) at Ellerslie on Tuesday. 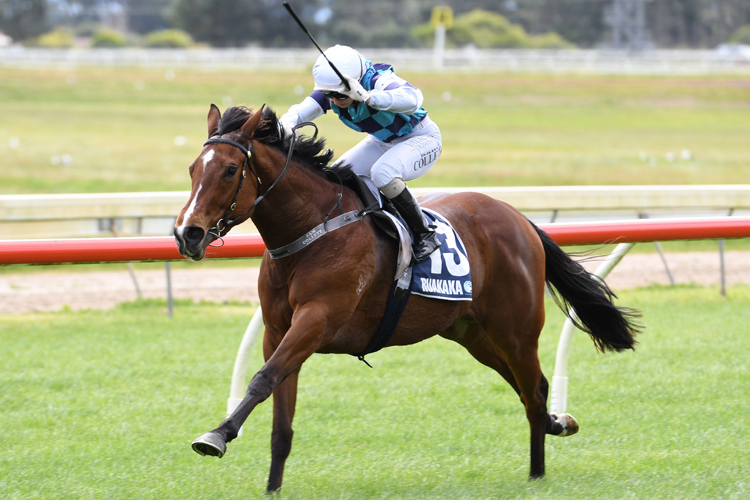 The Chris Gibbs and Michelle Bradley-trained mare won the Gr.2 Royal Stakes (2000m) on the same track on New Year’s Day and her connections believe she has taken a lot of improvement from her last-start unplaced run in the Gr.1 Livamol Classic (2040m) at Hastings last month. “I thought it was a really good run,” Gibbs said. “She was always going to be disadvantaged with the speed of the track and at weight-for-age. “I think if we had gotten some rain it would have brought us right into but it didn’t happen. Gibbs said there are some handy horses in the field in Tuesday’s contest, but is confident his four-year-old can test her much older competition. Gibbs believes Hello It’s Me is a big chance in the Ellerslie feature and has earmarked her for further black-type targets this spring. “We might be coming into the wrong time of the year with her, but we’ll quietly pick our way along until we decide to pop her back into the paddock again around Christmas,” Gibbs said.